Do your part to help the Buchanan-Foster campaign by getting plugged in on a local level. Read frequently updated messages from your state coordinator. Correspond with your local coordinator. Be informed of local events. Contribute your unique gifts and talents.First, you need to select your state from the list above. Then, call, write, or e-mail your state coordinator and get involved. Call talk shows for Pat! Receive up to the minute updates, scheduled TV and radio appearances, notifications of when Pat or Ezola are coming to your town. All in your e-mail inbox. Just send an e-mail to Jeff Jatras. Buchanan came to Maine on Monday as part of a two-day blitz through New England that started in New Hampshire, where he won the presidential primary four years ago, and ends tonight in Boston, where his two major-party opponents will debate without him. 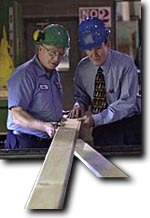 While the LaValley Lumber yard in Sanford was a typical setting for a presidential candidate’s photo opportunity, Buchanan’s message was not typical. If you would like to make a special contribution that will be earmarked for the making and distribution of Buchanan Foster immigration ads, click here. Reform Party presidential candidate Pat Buchanan said he isn’t letting up in his campaign, despite most polls showing he will hardly register with voters Tuesday. Patrick J. Buchanan and Ezola Foster are on the Presidential ballots in 49 of the 50 states, have full state of elector college memebers in all 50 states, and can be written in by Michigan voters. 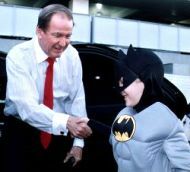 Reform Party presidential candidate Pat Buchanan this week is making a final push for relevancy in the 2000 campaign with a multimillion-dollar, 27-state advertising blitz. click here for more of today’s hot stories. Check out our On the Trail… section. With Trail Master Linda Muller keeping you informed of the latest news, anecdotes, and photos direct from the campaign trail! Find Out Why! Stop in every week for the latest additions to our Trail Mix of news nuggets and timely quotes. It’s our weekly news in review — All about our candidates and our campaign… On the Trail!